The School of Materials Science and Engineering (MSE) has a research portfolio that focuses on all classes and forms of materials, including metals, ceramics, polymers, fibers, textiles, composites, nanostructures, and bio-enabled/biomimetic materials. As illustrated in the figure below, the process-structure-property-performance paradigm is the core that integrates the various research activities that are aimed at addressing a multitude of functionalities from structural load-bearing applications to energy storage and harvesting; and electronic, photonic, and opto-electronic devices to drug delivery and biomedical implants. As a world leader in educating the next generation of materials scientists and engineers, MSE faculty continue to define the future of our discipline through research innovations focused on envisioning, predicting, designing, and developing materials, aided by the principles of the Materials Genome Initiative, for meeting societal grand challenges in energy, environment, health and human welfare, infrastructure, security, and transportation. To learn more about the specific research areas of faculty in various materials forms, click on the material in 2nd ring from inside, and for research aimed at specific societal challenge click on any term in outermost ring. Environmental concerns have been at the forefront of limiting technological advances in various industry sectors. In addition to climate change issues associated with waste gas emissions from automobiles and factories, access to and development of clean water, consumption and waste of raw materials during primary/secondary materials refining/separation processes are all important environmental issues that scientists and engineers are actively trying to resolve. Materials based solutions being researched by MSE faculty include advancements in filters, sensors, and catalysts, modifications of materials processing approaches with significantly improved yield or conversion efficiency or increased recycling, as well as light-weighting of devices and vehicles for overall reduction in use of such materials as well as reduced energy consumption. Materials play a major role in augmenting concerns about security in the homeland and on the battle field. From X-ray machines and metal detectors to safety glasses, and advanced composites for airframes or soft and hard armor for protection of personnel and vehicles to structural barricades for buildings, material scientists are constantly researching and developing new materials for these applications. This is a major area of research being pursued by MSE faculty. 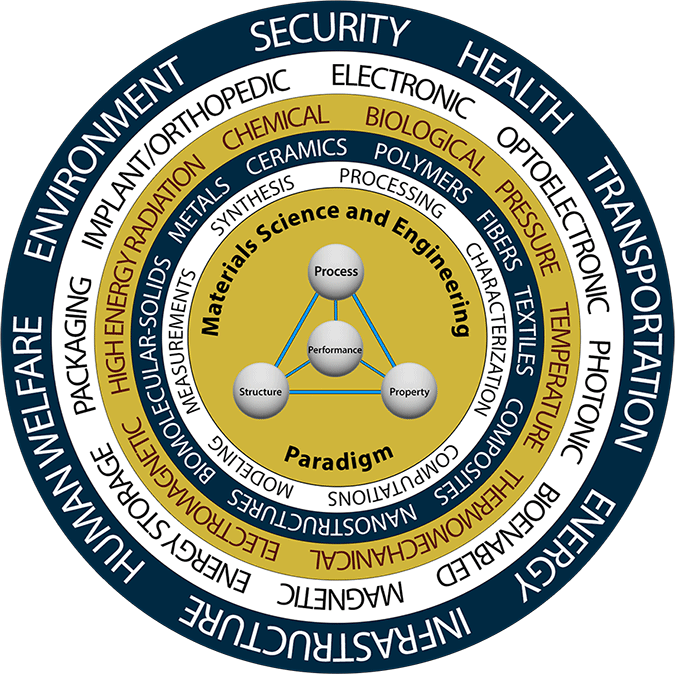 It involves advancing the fundamental understanding of the materials response under extreme conditions of high stress, strain, and strain rate; learning lessons from nature to design materials for various types of diagnostic devices, sensors, and protection systems; fabrication of soft and hard light-weight armor materials; as well as developing batteries and other powering sources for various portable devices. Advances in health care and human welfare are significantly benefiting from the role that materials play not only in terms of their use as implants or for drug delivery applications, but the new technologies that help with disease detection which also rely on developments in materials. Research relevant to the understanding of traumatic brain injury (TBI) from collisions on athletic fields or blasts on a battle field, or osteoporosis due to degradation of bone density, development of protection systems from sports or other injuries, medical textiles that help with patient care or packaging materials that provide better food safety, orthopedic implants and limb replacements or methods for tissue fixation or bone repair, are some of the areas being researched by MSE faculty. Transportation of today is dictated by the ability to achieve high speed, maximum vehicle safety, minimum energy utilization, and low cost, none of which can be compromised. The challenge therefore, is the conflicting characteristics that are often required in materials to meet these demands. Advancements in air/water/land based transportation are consequently limited by the time it takes from development to deployment of materials that satisfy the demanding performance requirements. This is one of the challenges where research guided by the Materials Genome Initiative (MGI) has the potential to make a significant impact. MSE faculty are actively pursuing research in various aspects of materials for transportation, leveraging the MGI program paradigm. Some of the efforts include developing materials for sensors, batteries, fuel cells; as well as light-weight Al- and Mg-based alloys and high-performance third-generation steels for automobiles; high-strength fibers and composites for airplanes and automobiles, and blast resistant alloys for ship hulls. The generation, conservation, and distribution of energy, is one of the most daunting challenges facing the world today. The United States is the 2nd largest consumer of energy, with average per-capita consumption being about 334 million BTUs per person. Materials play a critical role in the design and development of next generation fuel cells, batteries, super-capacitors, solar devices, gas generators and nuclear reactors, and in power distribution grids. Research in the so-called “Energy” materials is being actively pursued by MSE faculty for many of these applications. The focus spans from developing new materials for electrodes used for energy storage and conversion, characterizing and modeling interactions across various interfaces, and generating the fundamental understanding of the effects of structure and defects on transport and electrical properties. The aging of infrastructure and the effects from natural disasters, accidents, and terrorist threats, makes this a grand challenge for society as a whole. Not only is the repair of infrastructure following major disasters cost prohibitive, so is its maintenance due to aging. Materials play an important role in terms of designing cost-effective and sustainable solutions from which the infrastructure is built, while ensuring environmental, energy, and aesthetic considerations, as well as for developing methods that ensure prevention, diagnostics, and repair of failed systems. Corrosion of infrastructure materials, such as in gas pipelines, power plants, as well as in paper (and other materials) manufacturing industries, design of novel construction materials and methodologies, understanding of aging and life cycle prediction from various mechanisms of failure of infrastructure materials, and development of coatings, sensors, and monitoring systems to prevent catastrophic failure, are some of the research areas being pursued by MSE faculty. Health care and human welfare in general, may well be one of the most discussed and hotly debated issues for the next ten years. Better food safety, vaccination delivery methods, general medical supplies, implants and limb replacements are all items that will need constant improvements and advancements for the foreseeable future. Ceramics representing inorganic, non-metallic materials have been researched at Georgia Tech since 1924 with the advent of the kaolin industry in Georgia. Increasing attention focused on ceramics in the 1960s to meet the needs of materials capable of withstanding the extreme environments in nuclear reactors and space-crafts. Today, research in ceramics is vital for advances in electronics and telecommunications, devices for energy conversion, storage and harvesting, catalysts and sensors, vehicle and personnel armor, as well as for ferro/piezo-electric devices, micro-mechanical systems, permanent magnets, automobile engines, and biomedical applications. Much work on various aspects of oxide and non-oxide ceramics in the form of nanoparticles, coatings, and bulk solids for a variety of structural and (multi)functional applications under ambient and extreme environment is being pursued by MSE faculty. Ceramics form the basis of two start-up companies led by MSE faculty, and a number of centers and multi-disciplinary research programs have ceramic materials as their core. Synthetic and natural polymers which play an essential and ubiquitous role in everyday life have seen the dawn of a new era in recent years, due to the ability to tune their functionality for use in a wide range of electronic applications, their formability and recyclability permitting use for a multitude of structural applications, and their inert response necessary for use in the health and medical industry. We have one of the largest polymer research portfolios amongst MSE programs in the US, with strengths in topologically-complex, functional, nanostructured, and shape-memory and bio-polymers, conjugated oligomers, supra-molecular and block-copolymers, as well as negative Poisson’s ratio polymers and nematic liquid crystals. Faculty research in polymers is focused on all aspects of synthesis, processing, recycling, characterizing, testing, modeling and computing, for advancing the understanding of process/structure/property relations needed for performance-specific design with polymers. From carbon-nanotube (CNT) based composite fibers to photonic crystal based optical fibers, MSE faculty are pursuing research in this area which is at the cutting edge of technology. The CNT based fibers are of interest not only as reinforcements in structural materials with extremely high specific strength and modulus, but also due to their enhanced multi-functionality for use in paper, textiles, and other platforms. Such fibers are currently being researched in the multi-million dollar fiber manufacturing facility in MSE at Georgia Tech. Photonic crystal and other optical fibers are also providing opportunities for use as diagnostic probes as well as for other innovative applications in the telecommunications industry. Textiles constitute amongst the oldest form of material which has been researched at Georgia Tech dating back to the days of the cotton-based manufacturing technology more than a hundred years ago, which resulted in graduates who went on to run successful textile businesses in the state. The advent of synthetic materials revolutionized the field of textiles, but negatively influenced the US textile industry. Today, research in advanced textiles is at par with any other form of advanced material. From textiles employing antimicrobial technologies for use in medical applications and sweat-resistant weave architecture for athletic apparel, to intelligently-designed wearable smart shirt, carpets, and sports turf, research in this area continues to be actively pursued by MSE faculty. Composite materials integrating various ceramics, fibers, metals, and polymer forms are being investigated for practically every conceivable application in aerospace, automotive, electronic packaging, orthopedic implants, energy storage, permanent magnets, household/sports equipment, wind turbines, etc. Research in various forms of composite materials by MSE faculty is geared towards their synthesis/processing/fabrication, characterization of constituent structure and interface characteristics, determination of function-specific properties, and computations and modeling from constituent-level aspects to the prediction of system performance of composite materials used in the form of linings or bulk forms, and ultra-light-weight foams or cellular or tensegrity-inspired structures. The Composites Research and Education Center provides a campus-wide interdisciplinary forum in this area. Nanostructured materials in the form of nano-particles, nano-rods, nano-tubes, nano-foams, nano-pillars, nano-layers, nano-flakes, nano-coatings, and nano-devices have dominated the research arena in the past two decades. It has increased awareness of materials in the community and been a topic of much interest even amongst chemists, physicists, and other scientists and engineers, because of the potential applications that can be exploited due to the possibility of attaining unusual properties, as well as the new science that can be understood in terms of material behavior due to nano-scale structures. Current research in MSE involves studies of nanostructured materials for medical applications such as imaging/diagnosing/ treating disease and bio-barrier coatings that prevent attack of implants; energy harvesting and storage applications including batteries, fuel cells, and supercapacitors; electronic/optoelectronic and photonic devices based on organic/inorganic metamaterials, quantum dots, and liquid crystals; as well as characterizing, determining, and computing the unique biological, chemical, mechanical, and physical properties of various forms of nanostructured materials. Research in biomolecular-solids and biomaterials such as lipids, proteins, nucleic and fatty acids, DNA, hydrogels, folic acid, beta-carotene, etc., is aimed at controlling, creating, and manipulating their form and function for solutions to issues and problems related to the environment, agriculture, energy, industry, food production, biotechnology and medicine. From their use as medical implants and markers, to sensing and drug delivery applications, to studies of bio-inspired and bio-enabled synthesis and formation of new materials for a variety of applications, the field of biomaterials is a rich area of research being actively pursued by a number of our faculty. It is the basis of one of the start-up companies led by an MSE faculty, and also the central theme of the BIONIC Air Force Center of Excellence. Metals have been an active area of research in MSE at Georgia Tech from the early days of the development of alloying theories, to casting and forming of advanced aluminum alloys for the aerospace industry, to the understanding of their mechanical behavior under monotonic/cyclic/dynamic loading for automotive and defense applications, and their use in corrosive (paper/petrochemical) and other extreme environments. Today, metals and alloys continue to be studied by MSE faculty with the process/structure/property paradigm at the core of developing alloys with designer nano/micro/single/poly-crystalline or amorphous structures for properties needed in applications relevant to biomedical, chemical, energy, electronic, photonic, structural, and other applications. Research in this area is the basis of major efforts in Integrated Computational Materials Engineering, which include IUCRC and MURI programs, as well as the extensive Mechanical Properties Research Laboratory which serves as a campus wide user facility.